Eighty-two-year-old Dee Blasingame, pastor of Calvary Baptist Church in Aransas Pass, knew it was probably time for him to retire. However, after his church lost its roof and most of its siding to Hurricane Harvey in 2017, he was determined to see them through full recovery. When the Texas Baptists Church Architecture team stepped in to help, Director Keith Crouch reported, “The first time I was there with [Pastor Blasingame], the ceilings and walls of the building were covered in mold, so we discussed the possibility of abandoning it.” But the church was worried that without their building, their long-standing feeding ministry to the families in the community would suffer. Thanks to the work of Keith’s team and others, Calvary is back to feeding their neighbors and about 95 percent back to being fully restored. 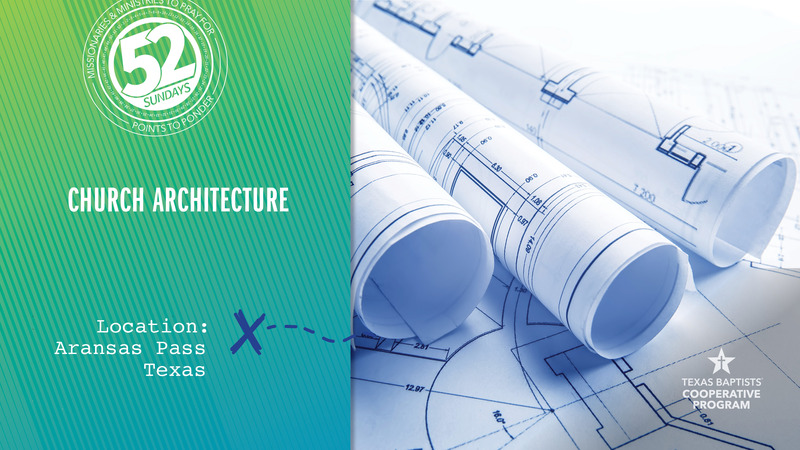 Church Architecture worked with 111 churches assessing damages and developing resources for recovery following Hurricane Harvey. Keith’s team also connected churches needing help with churches offering help, such as First Baptist Terrell whose volunteers made at least eight trips to Aransas Pass over nine months to help rebuild and repair Calvary’s building. Let’s pray for Calvary Baptist Church and the many others assisted by the ministry of Texas Baptists Church Architecture whose highly skilled services are made possible by our church’s gifts through the Cooperative Program.